A positive reading means that collectively this group is a net buyer of gold, while a negative reading means that the group is a net seller of gold. You’ll notice on this chart that the speculators (Green and Blue Lines) are buying large amounts of gold at the tops in 2006, early 2008, and 2011. But look at how the speculators buying activity comes to a halt when prices are getting ready to blast off in 2004, late 2006, and at the bottom in 2008. In the last month, the speculative buying activity has completely died. The speculators haven’t been this afraid to buy in years! On the other hand, the Large Producers of gold (Red Line) are typically sellers of gold since that’s the business they’re in. Therefore, the Red Line on this chart is most often going to be below the zero line. They like to sell a lot of gold when the prices are high, and when prices are lower they don’t offer out as much. In the last month look at how they have really pulled back from selling gold to the market. It’s the closest the producers have come to being net buyers in 12 years! If you were in the business of manufacturing cars (a car producer), you wouldn’t want to be buying finished cars because you're trying to get rid of the inventory you already have. But, if finished cars were coming back on the market at prices that were ridiculously low, and you knew demand was strong enough to take your extra inventory, then you’d be OK with buying cars. Producers of gold have almost gotten to that point, and at the very least they don’t want to sell too much gold at these low prices. The easiest thing to do is to buy gold bullion. Demand for physical gold is very high due to all the risks of “paper gold”, which includes ETF’s and other types of gold certificates. So the premium to spot price will be a bit high, but try to get your bullion below $1,400 an ounce. There’s also a rare situation that’s occurring in gold stocks you should know about. Relative to the price of gold, gold stocks are at historically cheap. In other words, gold stocks are way too low compared to the current price of gold at $1,320. Gold stocks should be much higher because their earning potential with gold at these prices is incredible. In fact, the last time gold stocks were this cheap was during the financial crisis of 2008, and after that gold stocks were up 200% in just six months! Before that was 2001, which marked the beginning of the massive 12 year bull market in gold. This is your cue to step up to the table and buy. Buy Barrick Gold (ABX) below $18/share and Iam Gold (IAG) below $5.25/share. These are two of the lowest cost gold producers in the world, both of which can pull gold out of the ground for around $750/oz or less. In other words, these two companies can make money even if gold were to fall all the way down to $800/oz. That’s a nice safety net, since other companies like Newmont and Kinross are at around $1,200 in costs just to pull an ounce of gold out of the ground. Barrick has a dividend yield of 1.13% and Iam has an even nicer dividend paying 4.66%. Buy them both and hold for at least a double, and if they go down further sell calls against your position to reduce your cost. 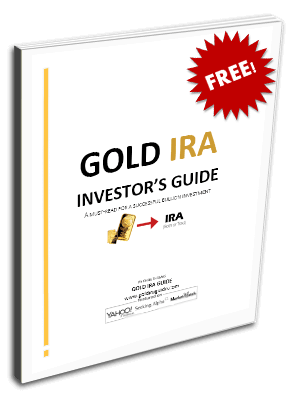 If you are interested in opening a Gold IRA, you can receive more information about the process by requesting the free gold investment kit below.